Editor’s Note: This article was previously published in the July 2012 issue of FLCAJ and is being republished as a valuable resource. I have been asked, “now that we realize the building needs concrete restoration, where do we start?” This prompted me to come up with a road map to follow in order to accomplish putting together your team and getting the project off the ground. Have a basic understanding of what concrete restoration is and what causes the need for the work. Understand basic restoration terminology and repair methods. Have regular building inspections every two to four years. Make sure that the key people involved understand the importance of having the work done. Determine how the project will be funded. Have an estimated timetable for the entire project. Put together your restora- tion team—association representative, qualified structural engineer, and a licensed certified general contractor that specializes in concrete restoration. Understand the contract documents, billing format, and warranties. Structural concrete restoration consists of repairing deteriorated concrete and rusted reinforcing steel to bring the structure back to its original specifications and condition. Structural damage is often found on elevated slabs and catwalks, decks, and parking areas. In Florida, most structural concrete damage is caused by moisture intrusion resulting in the rebar rusting. When moisture penetrates the concrete, it causes the rebar to rust. As rebar rusts, it expands up to seven times its original thickness exerting a force of more than 10,000 psi that causes large cracks and spalling concrete. Seemingly insignificant problems on a building’s surface may be outward indications of much more serious problems beneath that can only be determined by a qualified, experienced structural engineer. AutoCAD — Program used to create the drawings of the balcony and show the repaired areas. Bond — Payment and Performance Bond is acquired by the contractor, at the associations expense, to ensure that the contract is completed and all sub- contractors and suppliers are paid. Engineer/Threshold Inspector — Structural engineer must also be qualified as a Threshold Inspector. This allows them to submit a Special Inspectors letter with the Permit Application. This means that the engineer will act as the inspector and send inspection reports to the building department as the job progresses. Overhead Spall — Spall located on the ceiling of a deck, patio, balcony, or catwalk. Slab spall — Surface spall located on a deck, patio, balcony, or catwalk. Through Spall — Spall that goes completely through the deck, patio, balcony, or catwalk. If a restoration project is necessary, it would also be the time for the association to consider doing other related work, such as upgrading sliding glass doors and/or shutters, railing replacement, and repainting of the entire building. A restoration project is a straightforward process. Difficulties can arise when there is a lack of a knowledgeable team, inadequate planning, incomplete information, poor communication, and poor worksite preparation. There are procedures that will help ensure proper repairs while minimizing unexpected problems. The first step to a successful restoration project is communication, ensuring the board of directors, manager, and owners understand the importance of the repairs. When there is doubt by the owners that the work is necessary to protect the integrity and safety of the building, the project will most likely experience interference by owners. This will result in increased cost and cause delays to the completion of the work. The directors must consider their options for funding a concrete restoration project. Does the association have sufficient reserve funds for the project? Will the board need to special assess the owners? Will the board choose to borrow funds from a lending institution? These decisions take time and consideration. If special assessments are needed or if the association will be asking owners to move reserve funds from one account to another, the time needed to call such meetings and obtain the necessary votes should be taken into consideration. If a loan is deemed the best source of funding, the loan process can be long and not result in a loan for the full amounts needed. Timetable for completion of work—to be submitted with bid based on estimated quantities. As the project proceeds, the timetable should be revised monthly. Once it is agreed the concrete repairs are necessary, it is important to select the proper team for a successful concrete restoration project. Association representation—the team begins with at least one member of the board of directors, the manager, or other interested persons who will be responsible for administration, adequate funding, and the day-to-day management for the project. The next team member to select is a competent and experienced structural engineer that is also a threshold inspector. Selecting a structural engineer begins by interviewing several engineers in the area with a record of accomplishment for successful concrete restoration projects. Since the building departments are not equipped or willing to perform the inspections required on a restoration project because of the use of swing stages and mast climbers going very high—some buildings are 30 stories/300 feet—the structural engineer must also be qualified as a threshold inspector. This allows him to submit a special inspector’s letter with the permit application. This allows the engineer to act as the inspector and send inspection reports to the building department as the job progresses. However, the building department still needs to be notified about the inspections, and a copy of the inspection letter goes in the permit package posted at the job site so that a building department inspector can come by and check it. This is all handled by the engineer and the contractor. How many inspectors versus projects? What is the company’s concrete repair project history? It is important that the engineer recognizes his/her responsibility to the association but also has a track record of dealing fairly and honestly with restoration contractors and has a staff adequate to provide timely inspections and meetings as required without causing delays. The engineers will also present a list of their fees before a contract is signed with them. The engineer chosen will survey the building and provide an estimated budget for the work based on estimated quantities of repairs; this will enable the board of directors to determine what funds are available or need to be raised by assessments or a loan program. Then the engineer will prepare and administer a bid package to solicit bids for the estimated scope of work to qualified contractors and assist the association in reviewing the bids. The engineer also provides signed and sealed specifications required for the permit, directs the contractor where to make the repairs and marks those areas, inspects the repairs as it is being done and after the repair is completed. The engineer also issues inspection letters and issues a final inspection letter to the building department stating that all work was completed as specified. The engineer reviews the contractor’s bills and approves them based on authorized repair quantities. There is no known method of inspection that can “see” the full extent of the deterioration until the concrete is actually chipped open to expose the amount of deterioration of the reinforcing steel inside the concrete. Because the full extent and scope of the work cannot be known beforehand, yet must be completed to these rigid standards, the actual quantity of repairs often exceeds the estimates. This explains why concrete repair projects are bid on a fixed unit price with estimated quantities. Many engineers recommend that associations budget a contingency of about 25 percent. This ensures funds are available to complete repairs properly without having to go back to the owners or the bank for additional funds. In addition, since the contractor will bill only for actual quantities of repairs completed, if work turns out to be less than estimated, the excess funds can be returned to owners or saved for future repairs. For this reason, hire an independent engineer rather than one who works for the contractor. Most engineers approve payments only for work they expressly required and approved. Change orders if any must be submitted by the contractor to the engineer for approval prior to performing any additional repairs. Most engineers notify the contractor that they will not approve payment of repairs not expressly approved in writing. After work begins, it is important to hold weekly progress meetings with the board representative, the engineer, the contractor, and his supervisor to discuss the progress, any problems, and suggested improvements to make the project run more smoothly. Minutes of the meetings, usually taken by the engineer, should be sent via e-mail or fax in order to keep all parties up to date. The next selection is a contractor with a minimum of five years experience in repairing similar buildings. The engineer is a good source for recommendations. So are board members or managers of nearby communities, as well as comments on contractors’ reputations by the local building department personnel. While the engineer’s opinions are important, it is ultimately the board of directors who hire and must get along with the contractor. The board of directors should review each of the contractor’s complete and detailed bids. Analysis of the bids should be predicated not only on price but also on the reputation, financial strength, and a successful history of each bidder. At that time, usually three contractors are selected for in-depth interviews with the board of directors and the engineer. This gives the board an opportunity to discuss the bid, the project schedule, and the manpower and equipment that will be used on the project. It is also very important to find out more about the contractor’s experience and the management team that will be involved with the project onsite or offsite, as well as any other concerns the board may have. The key to a successful project is communication between all parties, and the interview will give the board members a sense of how comfortable they feel communicating with the contractor and his/her project team. Most boards of directors rely a great deal on their community manager, or hire a project manager, during the project. It is recommended that the manager and/or project manager be involved from the very beginning to gain a complete understanding of the project. This ensures that the board will be able to keep the unit owners informed of any changes to the schedule of the project. 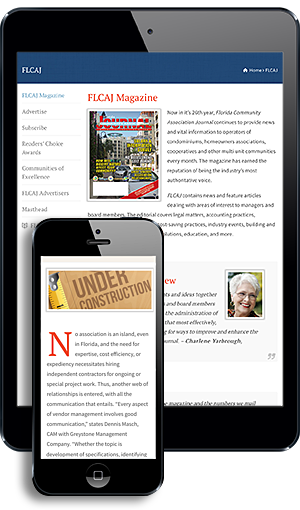 Who holds the State of Florida Certified General Contractor’s license? The size of the work force. Proper insurance coverage (general liability and workers’ compensation insurance). The ability to secure payment and performance bonds (even if the association does not wish to have payment and performance bonds, the ability of the contractor to ascertain them is a good indication of their financial stability). After the selection of the team, the next step is negotiation of the contract. Some associations request that the attorneys handle this from the beginning; others request the contractor send a contract directly to the board to be reviewed. However, if the association’s attorney will be ultimately reviewing the contract, it actually saves time to have them involved from the beginning. Otherwise the contract is negotiated between the association and contractor and then the attorneys do it all over again. A standard stipulated sum contract simply does not work for concrete restoration projects. While the scope of work is known, the actual quantity of the concrete requiring repair is just an estimate based on the engineer’s inspection. The actual extent of the damage cannot be determined with any accuracy until the damaged concrete is chipped away. Because of this uncertainty, a “unit cost” contract has become the standard contract-billing format for concrete restoration work. Under this type of contract, the owner pays only for repairs actually completed based on square footage, linear footage, or, in some repairs, cubic footage of concrete. The contract language will normally be negotiated between the association’s attorney and the contractor’s attorney and then approved by the board of directors and the contractor. This ensures that the best interests of both parties are protected. The Main Contract — Addresses the parties to the contract, the estimated contract sum, retainage, estimated time to complete the project, how to address change orders in the scope of work, insurance requirements, billing procedure, payment terms, and warranty. There may be other items that are unique to a specific project. The contractor must get any change orders with all relative information to the engineer and the owner in a timely manner, so that it can be reviewed and approved quickly for the least amount of negative impact to the project schedule. General Conditions ­— Addresses standards of work, licenses, property damage and personal liability, insurance requirements, workforce standards, provisions of facilities and services, safety, work hours, and indemnification. There may be other items that are unique to a specific project. Unit Price List — Contains a list of repair items, unit measurement (SF, LF, CF, etc.) unit price, estimated quantities, and costs of mobilization and other items, such as permits and bonding. This is usually a direct copy of the contractor’s unit price proposal in response to the bid solicitation. Engineer’s Project Manual — A project manual is written by the association’s engineer, usually a duplicate of the instructions to bidders and specifications that the contractors received prior to bidding the project. A Certificate of Insurance naming the association as additional insured. A Notice of Commencement Form—Must be signed by the “owner” and recorded at the courthouse. Permit Application prepared by contractor—Each building department in every munici- pality has completely different forms; there is no generic form. A letter to the building department on the associa- tion’s letterhead stating that it has hired the contractor to perform concrete repairs. A letter to the building department on the associ- tion’s letterhead stating that it has hired the engineer. With these documents, the contractor can apply for the permit immediately. The local building department issues permits, but, as previously mentioned, most building departments are not equipped to perform inspections for concrete repair projects; therefore, the association’s engineer will act as a “special inspector” to perform inspections and submit weekly inspection reports to the building department. After the contractor is selected and the contract is executed, a pre-construction meeting is scheduled. The purpose of this meeting is to designate areas that will be available for the contractor’s trailer (field office) and other equipment, contractor employee parking, discuss a future meeting schedule, and address any other issues or concerns. A pre-construction meeting includes the board representative, the engineer and the contractor, as well as the supervisors that will be permanently assigned to the project. Seemingly minor details like where to place dumpsters and port-o-lets or store job equipment and materials can become a source of annoyance to owners if not adequately addressed beforehand. While the permit is being processed, the parties may choose to have the contractor mobilize the project—meaning bring in scaffolding, equipment, dumpsters, and port-o-lets so work can begin as soon as the permit is issued. Mariann Gerwig has been the Director of Finance and Operations at Carousel Development & Restoration, Inc. since 1988. For more information, contact her at (561) 272-3700, e-mail mgerwig@cdri.net, or visit www.cdri.net. Gerwig has also been the Chief Financial Officer for Aluminum Design Products, Inc. since 2011; you can contact her there at mgerwig@apdinc.biz. Gerwig was part of the Ad Hoc committee 2000 and continued on as a director for nine years at her own association. Before beginning work on the building, the contractor should perform an existing condition survey of the building—usually done in video and written form. This documents the condition of the building and surrounding areas, such as landscaping, and eliminates any question as to the existing condition of areas later claimed to have been damaged during the progress of the work. This protects the association as well as the contractor. The association’s engineer will mark where the contractor is to make repairs. Each engineer may be a little different, but the markings are done with a pencil or felt tip type marker that shows where and the size of the excavation required. For the repairs to be covered by the contractor’s warranty, the repairs must be made in accordance with the International Concrete Repair Institute (ICRI) standards, which specifies how and to what extent concrete repairs are made. The engineer performs additional inspections as the repaired areas are being prepped and new concrete is poured and cured. Testing of repaired concrete is also performed by an outside, independent testing firm to ensure that the concrete has reached its required strength before additional work can be performed on those areas. There are times unit owners may wonder why it appears that work has stopped on a balcony and the contractor has started working on another area. This question usually occurs during the curing/testing period. During the curing/testing period, the engineer will specify the strength of the concrete to be used per square inch (psi); usually 5,000 psi. The concrete testing company will be on site when the concrete pour is being done and will take several cone-shaped samples back to their lab. There the samples will be tested to see how strong they are at 7, 14, and 21 day intervals and send reports on each test. The forms for the concrete cannot be removed until the specified strength has been reached. Because the contract sum is not based on a stipulated sum, billing on a percentage of completion is not applicable to concrete restoration projects. Lump sum items such as mobilization, general conditions, and permit can be billed on a percentage, but are often billed in full, particularly mobilization and permit fees. For billing of completed concrete repairs, a detailed schedule of values will show the quantity of specific unit priced items completed during the billing period and to date. The first page is a summary with the first part reflecting the original contract amount, any increases or decreases to the contract amount by change orders, increase/decrease of quantities, and adjusted contract amount. The next section of the summary page shows the total amount of work completed to date, the amount of retainer being held, the total value of work performed less retainer, total of previous payments made to the contractor, and the amount of the payment due for the current payment requisition (draw). There should be several pages included with each payment requisition that gives detail of where the work was done, including a drawing of the area. With new construction, everything is covered by the contractor’s warranty; however, in restoration projects only the repaired areas are covered under warranty. Many times, an association will complain several years after completion of work that additional concrete is damaged. Unless that specific area was repaired in the previous project, the new damage will not be covered by warranty. The best way to ensure the association’s warranty applies to the exact area repaired is to require the contractor to include with each payment application the summary page, the detail page, and spreadsheet for each unit showing measurements of each repair and a balcony drawing showing the location and nature of each repair made. This would be the equivalent of an “as built” drawing on new construction. This drawing also protects the contractor against unwarranted claims of defective work. Protecting the investment in the repairs is very important. Therefore, the concrete should be waterproofed and painted as soon as possible with materials and specifications designed for maximum protection. 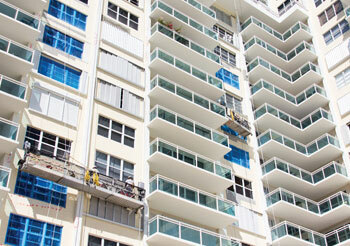 Many restoration contractors have the ability to provide waterproofing and painting as part of their bid. The warranty on concrete restoration projects is normally five years on the concrete repairs and waterproofing. Alteration of the repairs, however, may void a warranty. If a unit owner installs tile or carpeting or penetrates the surface of the concrete to install items on a balcony, the warranty will likely be voided. Associations should provide copies of the warranty to all unit owners requiring them to sign as having received it. If the unit owner does anything to void the warranty without prior approval from the association, the unit owner will be responsible for damage not covered by warranty exclusions. The concrete repairs performed in accordance with specified materials and procedures provide a very durable repair. Most warranties specify that if any problem is found in the area of the repair, the association’s representative must notify the engineer of record and the contractor in writing. Together they should examine the areas in question and refer to the “as built” drawings submitted by the contractor with each invoice. The engineer is the final judge as to whether the problem is covered under the warranty or if it is a new repair in an adjacent area. The warranty issue is another important reason to hire a contractor with substantial resources and a history of honoring the warranties. If other types of work are done in conjunction with concrete repairs, the warranties for that work can vary, depending on the type of work done and the products that are used. In addition, if the restoration project includes sliding glass doors, railings, and exterior painting, the association should also receive warranties directly from the manufacturer, which are provided by the contractor with its final payment application.